Drexel Hall, site of much Midtown history, sits at the corner of Linwood and Baltimore. View here is from Baltimore with Linwood on the top left. It would be easy to drive past Drexel Hall at the corner of Linwood and Baltimore day after day without any idea of the layers of history within its walls. Beginning with its unusual beginnings as a spur-of-the-moment purchase by a shrewd businesswoman, to its early days of concerts, dances and suffrage association meetings, to the fiery union rallies of the 1960s, few buildings in all of Kansas City have facilitated more important cultural, political and social events. 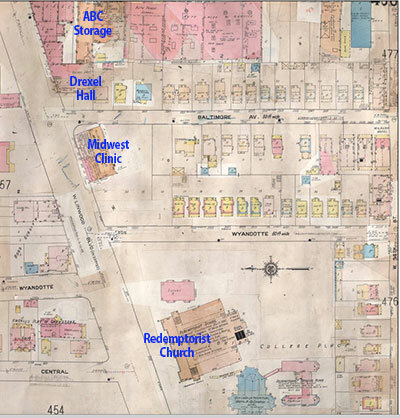 This 1909-1950 Sunburn Fire Insurance map shows Drexel Hall just east of Redemptorist Church. As part of our Uncovering History Project, the Midtown KC Post is taking a look at the 1940 tax assessment photos of each block in Midtown. But there is so much history around Drexel Hall at Linwood and Baltimore that the building deserves its own post, so we’re deviating this week with an entire post dedicated to this important spot. Drexel Hall takes its name from the women who built it, Barbara Drexel Bescher, who as far back as 1915 was recognized as a savvy businesswoman. Bescher was an immigrant from Austria. Her first husband, John, opened a grocery store at 15th and Main in 1870. But in 1896, the two divorced, with Barbara telling the court her husband had abandoned her nine years earlier and did not contribute to her support. In a 1915 Kansas City Star profile, Bescher, then 65 years old, told a reporter how she went from being broke to rich in 20 years. At the time of the divorce, she said, she had $200 and was responsible for seven children. With a lot of hard work, the market stall was a success. Then one day, Bescher remembered later, she was driving along Hunter Avenue (an earlier name for Linwood Boulevard) and she saw a lot for sale. “I liked the look of the place and thought it would be a coming district,” she said. The owners wanted $7000; she offered $6,500; and they settled for $6,750 that same day. Soon, the original owners were back, telling Bescher they had sold too cheaply. But she kept the land, built Drexel Hall on it, and in 1915, she said it was bringing in $500 a month. Twenty years later, she had made a fortune of $100,000, profits from her city market fruit and vegetable stand, the management of Drexel Hall, and other business ventures. What Bescher may have seen before others was that the new suburbs developing south of downtown just after the turn of the 20th century needed entertainment venues. She built a hall large enough to accommodate concerts, dances and weddings. The main entrance of Drexel Hall faced Baltimore, with additional shops and space with doors on the Linwood side. Drexel Hall became an important spot. For example, in 1914, the Miss Barstow School (then located on Westport Road near Main Street) used the hall for a concert. A sampling of other activities in the hall that same year shows its wide-ranging role in Midtown society. Drexel Hall was the location for: local suffrage association meetings; the annual Mayflower ball given by the children of the Paschal School of Dancing; Drexel Hall subscription dancing club events; Drama Club plays; Schubert Club concerts; Comedy Club performances; a Boy Scouts camp benefit; lectures and concerts supporting music appreciation; sorority meetings. Miss Helen Thome’s dance studio was also located there before it moved to Westport Road. In the 1960s, Drexel Hall became a popular venue for the labor movement and political rallies. The Commercial Telegraph Workers voted there to strike against Western Union; the Retail Clerks International Union agreed to strike against Katz Drugstores; Milgram’s workers organized; and the UAW met in Drexel Hall. At the same time, local residents held card parties and the Unidentified Flying Objects Society held regular meetings. More recently, Drexel Hall has been used as a wedding venue. 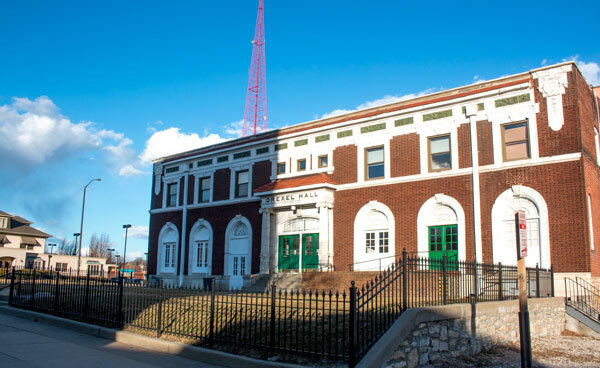 The Kansas City Irish Center is also currently using space in the Drexel building.